Welcome to the Ultrasound Leadership Academy (ULA) summary blog series. This week, we summarize lung ultrasound. The ULA is essentially an online advanced ultrasound education experience put on by the team from Ultrasound Podcast which brings cutting edge learning to emergency medicine personnel through a variety of interactive platforms including video lectures, google hangouts with experts, simulation, live conferences and real time scanning with a pocket-sized ultrasound device known as a Vscan. Roy Lichtenstein is pretty famous too. The origin of lung ultrasound dates back to the 1990s when a doctor by the name of Lichtenstein began publishing papers on his findings in this area of research. He first described artifacts such as comet tails and b-lines and found that in a particular study, comet tails were present in a significantly higher proportion of patients with pulmonary edema. A year later he also found a utility in the comet tail artifact in ruling out a pneumothorax. Throughout the early 2000s he continued to be a prominent influence in the development of lung ultrasound. While there has continued to be a plethora of evidence for lung ultrasound since the 90s, there still appears to be a delay in technology adoption. With the ability to detect a pneumothorax at a much higher rate than CXR in trauma and differentiate COPD from ADHF in the undifferentiated SOB patient in the ED, why not begin to incorporate this into our practice? The Concept: Sound waves reflect differently when they encounter lung when it is in different states other than its normal air-fluid balance. One important thing to note about lung ultrasound is that it is vastly different from most of the other scans we do. When you think about echocardiography, what you see on ultrasound resembles what you would expect the anatomy to look like on CT imaging. Conversely, lung ultrasound depends on artifact analysis rather than direct visualization of anatomic structures.With this is mind, think about the artifacts we are seeing in the lung as representing different air-fluid states within the lung. This can then be translated to diagnosis that would fit with these physiological states. Transducer type: Linear, phased array or curvilinear will provided sufficient views however curvilinear is recommended using during FAST exam to avoid having to switch probes. Placement: Longitudinal. Your goal is to obtain cross sections of the ribs and intercostal spaces to evaluate the underlying lung. Be sure to stay perpendicular to skin surface at all times even when scanning laterally. Your are looking for lung sliding, if you see it, this suggests normal lung. If it is absent this will suggest something is wrong but does not necessarily point towards a pneumothorax. A-lines or B-lines, lung point? We will go through the artifacts one by one in the next few sections. Lung sliding is intuitive. You are looking for the visceral and parietal pleura sliding along one another during respiration. Look just deep to the ribs and visualize a hyperechoic line moving back and forth. It appears to shimmer. Or you may imagine ants marching along this bright line...whatever works for you. A-lines are reverberation artifacts. They will appear as hyperechoic lines at regular intervals from the pleural surface. These indicate a predominance of air within the lung which can be normal or abnormal depending on presence or absence of lung sliding. When you see A-lines, consider pneumothorax, COPD/emphysema, normal lung, PE (this would represent area that is not infarcted). B-lines are ring down artifacts that represent rapid horizontal reverberations which appear vertical in nature. They are laser-like, hyperechoic lines that move with respirations and erase A-lines. Do not confuse these with comet tail artifact which DO NOT erase A-lines. B lines indicate a predominance of fluid in the interstitial space. When you see B lines, first assess if they are focal or diffuse. 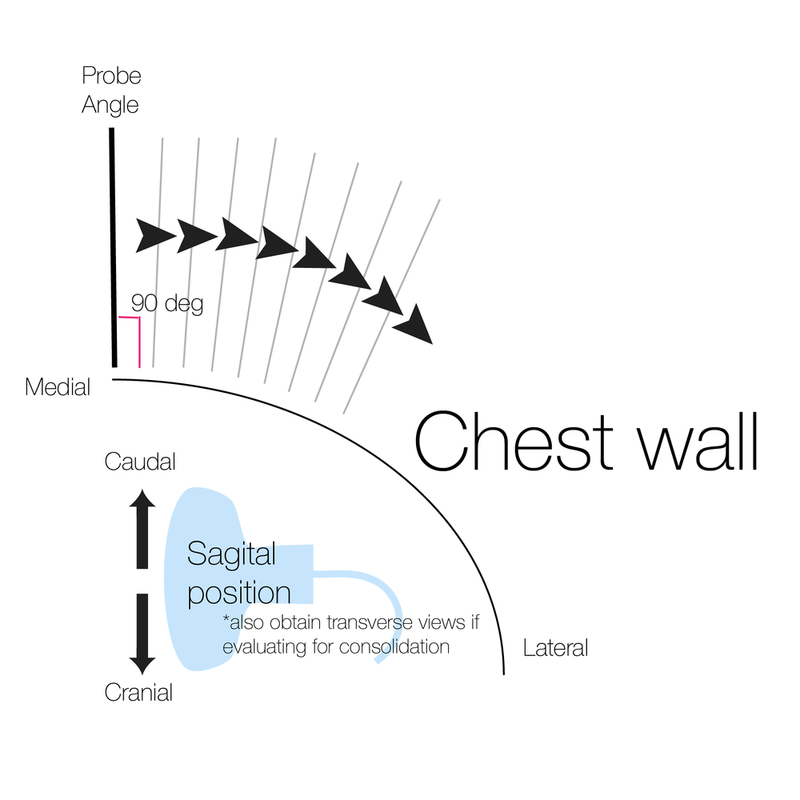 See the graphic in Lung technique section for where to position the probe for this evaluation. It should be oriented in the cranial-caudal direction. Step 1 (rule out): Assess for lung sliding. The presence of lung sliding excludes pneumothorax in the area you are viewing. Be sure to evaluate multiple intercostal spaces. Step 3 (rule out): If you see B-lines, there is no air separating the visceral-parietal pleura and therefore no pneumothorax, consider other diagnosis. Step 4 (rule in): If you see a lung point, where one portion of interspace is sliding and the other area is not, this is pathognomonic for pneumothorax. You are done. You can now size the pneumothorax for fun. Beware subcutaneous emphysema! If a pneumothorax is large enough and tracks into the soft tissue, you will see irregular hyperechoic lines superficial to the ribs which will obscure the view of anything below. These are known as E-lines. This is a pneumothorax! You will not always evaluate for a pneumonia using ultrasound in your everyday practice. Often a chest x-ray will be sufficient but think about using it when the diagnosis is uncertain, your patient is really sick or when it is a pediatric patient and radiation is a concern. This exam will require a more thorough evaluation. You need to evaluate the part of each lung lobe that comes in contact with the parietal pleura. That being said both transverse and sagittal views must be obtained in the anterior, lateral and posterior windows on both sides of the chest. Tissue density/consolidation: The lung may actually appear similar consistency to the liver (hepatization). Make sure that this is not mirror artifact. C-lines: These are sub-pleural rounded hypodensities. You will often see b-lines coming off of the base of these hypodensity. Air bronchograms: These will appear as hyperechoic lines within the lung fields. You may see air bubbles moving in and out of these areas dynamically with respirations.